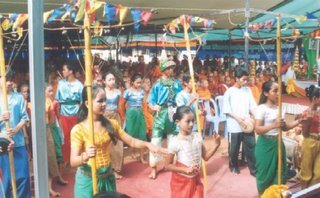 There are many riddles and secret stories behind the Cambodian New Year Festival. In this article, I would like to try to outline some meaningful philosophy behind the scene of this auspecious festival. Why are there three good fortunate parts of the day? - Three important functions of human beings leading to achievement. Firstly, human beings always wash their face in the morning. They are ready to welcome the first glance of the dawn. To wash their face refers to the purifying of six senses; the eyes, the nose, the ears, the tongue, the body and the mind. To clean our eyes in order to get rid of dusty vision such as greedy, hatred, illusion, delusion, jealousy, cruelty and stinginess. When our eyes touch the beauty of nature and society provided by the sunshine after we have already washed, it shall give us the mindful and thouroughly contemplation. Our nose is the same. It will smell the new different odors mindfully. Our ears will listen to the different sounds and voices intentionally. Our tongue will taste the food contently. Our body will touch things according to a tangible and sensitive awareness. And our mind will wander around the useful thought. If our six senses signified these washing processes; it will enrich our mind and heart with wisdom, compassion, loving-kindness and make the day a better era to live. Secondly, our good fate is in our chest and body. Truly, we always wash our body or have a bath during this time because the weather is so hot and dry. So why is it good fate by just having showering?. Because after showering, we feel fresh to welcome good things. According to the Dhamma, we shall not wash away our bodily dirt but to wash away our dirty mind. Body and mind are essential component of our body. If we clean only body, by not clean the mind; we are considered as dirty or ugly. Thirdly, we should wash our feet and hands neatly before bedding. It is important that if we don't clean our feet and hands, the mice or cockcroaches will come to bite or bother our night-sleep. According to the Dhamma, it means we have to prepare or be ready to rest our body and mind perfectly. So when everything is mindful before bedding, the sleeping span is peaceful and the waking time in the next morning will be peacefully and gloriously. Why the seven Angels and people concern very much about the caring Kabila Brahma's head? - Certainly, according to the story narrats that Kabila Brahma's head is so powerful, miracle and sacred. If this head fell down our earth, the earth will be exploided; if the head fell in the ocean, the ocean will be dried out; and if the head floated in air, the air will be devastated and has no rain. This is an interesting clue. Literally, Kabila refers to a wise old man in the history of Buddha. Brahma refers to the Sublime States of the Mind. However, Kabila Brahma in this story implies to the god of creator which people mostly call Preah Prohm. Kabila Prohm or Preah Prohm has the same concept refering to the Sublime States of Mind. 4. Equanimity : be straight or balancing by not biased or discriminated of four things. They are by loving, hate, fear and delusion. It must be just judgement. Eventhough, Tevada or Angels love to take care these four sublime states of the mind and take their turn on each day of the week according to the beginning day of the new year. More than this, human beings cannot survive if they didn't have these Four Noble States of Mind in their heart. Why god of creator like Kabila Prohm has been beheaded because of his losing in an intelligent competition with normal human person like Dhammapala? - This is very important to illustrate to all of us that "the capacity and ability of human beings are superior than those of heavenly beings, when those human beings use their potential and keep in effort". Dhammapala is genious. He has good memory and can orally cite all the Veda canons and can understand the birds' languages. Finally, heavenly beings like Kabila Prohm has to kneel, accept and respect the potential endeavor of Dhammapala. He beheaded himself to witness to everybody(human beings) to effort and be mindful for the individual's achievement and enlightenment. Why do people build the sand-mount during New Year Celebration? - They build the sand-mount for this occasion in order to worship the Veluka Cedi(sand stupa) which splaces the remains or relics of every Buddha. It also symbolizes the Culamuni Cedi in Tavatingsa heaven realm which places our present Buddha's relic, Preah Samana Godama. Sand, rice or peanuts are acceptable to make a mount during New Year time. It provides us the sense of offering, stopping all vindictiveness and unitize our society. Why do people wash the Buddha's statues and sprinkle on each others? -It is a good opportunity to wash away our bad luck by washing the representative image of Lord Buddha or the Enlightened One. As Buddha said "those who see me, see the my teachings; those who see my teachings, see me". So, Buddha's statue represents the three virtues of noblest one(Lord Buddha) such as His purity, compassion and wisdom. And also it represents His teachings and efforts to find out the way of highest bliss(Nibbana). Water symbolizes the sympathetic mind and compassionate thought. So when we sprinkle on each others with true intention and hospitality; it offers us the environtment of peace, stability and progressive. 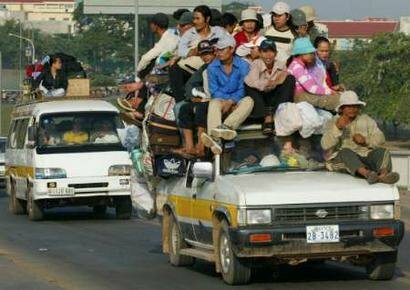 What do people get from this New Year Celebration? 1. To learn the meaningful riddles of each year in order to repeat and remind themselves in cultivating the good, avoiding all evils and purifying their mind. 2. To have chance of family reunion and pay respect or gratitude to the elders. 6. 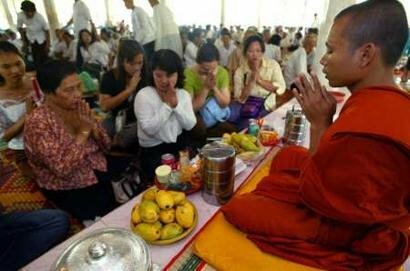 To receive a chance of accumulating merits by offering food to the Bhikkhu monks, help poor people, and fostering the contentment of living. 7. 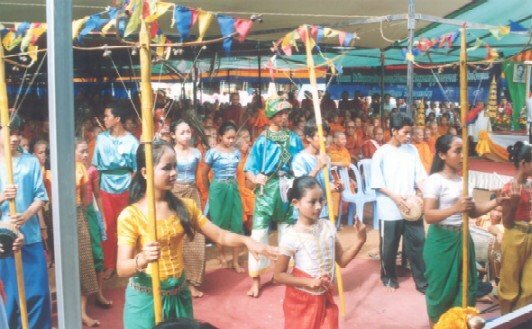 To enjoy traditional games, colorful clothing, friendly associating and other entertainings.